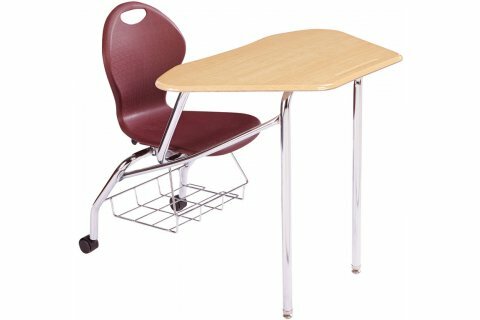 Are your students frustrated by the inconvenience of regular chair-desks? Are they tired of yelling across the distance every time they have to work in groups? The Collaborative Unity Series combines the flexibility of a petal desk with the convenience of a combo desk, so working together is as easy as ever. This strikingly unique design is ideal for the modern classroom. The petal-shape work surfaces of these combo desks fit together for incredible versatility. They allow students to work in pairs, threes or even groups of six with an easy arrangement that enables students to see and hear each other easily. Contoured ergonomic seats make these chair desks a pleasure to work at. To top it all off, a super strong frame guarantees that your students will be studying and working together at these combo desks for decades to come. Collaborative Design: Petal-shaped desktops fit together perfectly for group study with two, three or even six students in a circle. Tough Desktop: the hard plastic surface will stand up to years of daily wear. Curvy Comfort: Integral lumbar support protects the lower back, and slightly curved sides hug the body for complete back support. 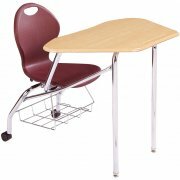 Sturdy Support: Chrome-plated 1 ⅛" round, high-gauge steel legs, seat supports and desktop supports make these desks exceptionally sturdy. 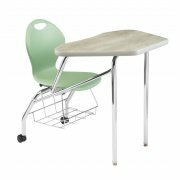 Under-desk Storage: A chrome-plated ¼" steel rod book basket provides an accessible space for notebooks and other class materials. Steady Surface: Glides are self-adjusting nickel-plated casting with nylon inserts which compensate for uneven floors.